Nora Sand is a tough-going journalist based in London who collects vintage suitcases when she's not interviewing war criminals and covering international conflicts. When she purchases a second-hand suitcase and finds a bunch of hidden photos of young girls, Nora unwittingly stumbles onto the cold case of two missing girls. Lulu and Lisbeth disappeared on a ferry ride to London in 1985 and were never seen again, and as Nora begins to use her journalistic skills to investigate the cold case, she begins to unearth new evidence. 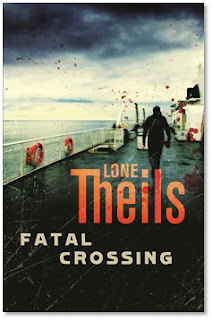 Fatal Crossing is a good slow burn mystery and was inspired by the true story of an American serial killer who stalked and photographed his victims before killing them. Nora is a strong female protagonist with plenty of great qualities and has a lot in common with the author. But the romance thread irritated me and I rolled my eyes every time Nora tried to clear her head of Andreas. The continual references to her dirty washing riled me up until I wanted to reach into the book and do her damn laundry for her. On the flip side, the relationship Nora has with her boss (and her nickname for him) was amusing and very 'real world' and her working relationship with Pete was warm and genuine. Fatal Crossing has been translated from Danish, and while the translation was smooth enough, I did bristle at the overuse of the word chubby to describe several female characters in the book. Fatal Crossing is already a bestseller and will be popular amongst readers who enjoy Brit crime and Scandinavian and Nordic noir. P.S. I just love the author's name, don't you? The Pumpkin Cookbook - 139 Nutritious Recipes for Year-Round Enjoyment by DeeDee Stovel is a gem for those who love pumpkin and those who'd like to incorporate more pumpkin into their cooking and baking repertoire. 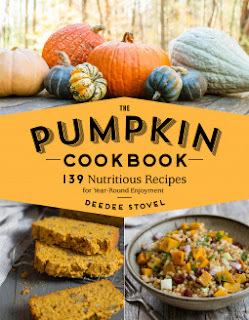 The Pumpkin Cookbook contains a tonne of recipes (139 in fact) in a variety of categories although I was surprised to find so many recipes calling for canned unsweetened pumpkin in their list of ingredients. Very interesting. I'm a visual person and while there are a number of stunning photographs throughout the book, I would have preferred more photographs of the finished dishes in place of photos of pumpkins and autumn scenes. The fact that there's no photo to accompany the recipe for Pumpkin Doughnut Muffins seems an absolute tragedy to me. The Pumpkin Cookbook was a delicious read and will be published on 25 July. (P.S. I reviewed an ebook copy of this book and realised just now that it has since expired. This means I'm unable to go back and trial any of the recipes or even look at them again. What a shame and just a little harsh in my opinion). I've finally read a book by Virginia Woolf and it was a sheer joy. A Room Of One's Own is a novel length essay that was originally given as a series of lectures to women at Cambridge University in 1928. The theme was 'women and fiction' and Woolf examines women writers in history, their various successes and failures and themes of gender inequality and education. A Room Of One's Own is a feminist text and still very much relevant today. Woolf concludes that "a woman must have money and a room of her own if she is to write fiction," and sets out to prove why. What added to my enjoyment is that I couldn't help but read it in her voice thanks to my frequent listening of the only recording of Virginia Woolf's voice available on YouTube. I was instantly gripped by her writing style on page 1, but reading the following description of a dinner on page 18 had me laughing and wishing I could be in her presence. Towards the end of her essay (remember it was a lecture given at a women's college) she calls on members of her audience. On page 106, she proclaims to give her peroration (don't worry, I had to look it up too): "Young women, I would say, and please attend, for the peroration is beginning, you are, in my opinion, disgracefully ignorant. You have never made a discovery of any sort of importance. You have never shaken an empire or led an army into battle. The plays of Shakespeare are not by you, and you have never introduced a barbarous race to the blessings of civilization. What is your excuse?" You can read the rest here. Woolf's writing is provocative and powerful and I enjoyed the ready access to her meandering thought processes as well as the ups and downs of her discoveries, statements and opinions. Reading her work almost 90 years after Virginia Woolf penned these words, I had the distinct feeling she was giving me a TED Talk about women and fiction. The TED Talk format is enormously popular - and a favourite of mine, I'll confess - and I'm certain that if A Room Of One's Own was marketed as a TED Talk it would reach and inspire an entirely new audience. P.S. Thank you to my neighbour for lending me his copy. thanks to the generosity of Hachette Australia. The second recipe I chose to share with you is a chicken and cheese strudel. My mouth is watering from just typing the recipe name. 1. Preheat oven to 200°C. Heat 1 teaspoon oil in a large, heavy-based frypan over medium-high heat and brown half of the chicken. Remove to a bowl and repeat with another teaspoon of oil and the remaining chicken. The chicken only needs to have some golden colour; it doesn’t need to be cooked all the way through at this stage. 2. Heat the remaining oil in the pan and sauté the mushrooms and garlic until the garlic is fragrant and translucent, and the mushrooms are a light golden colour. The mushrooms will release liquid as they cook, so continue to cook until this liquid evaporates. 3. Return the chicken to the pan and sprinkle the flour over the top. Stir to coat the chicken. Stir in the milk, 1⁄4 cup at a time, allowing the sauce to cook and thicken between each addition. When all the milk is added, bring the sauce to a simmer and stir in the mustard, salt, pepper and two-thirds of the cheese. Simmer for a few minutes or until the chicken is cooked through. Remove to a bowl and allow to cool. 4. Preheat the oven to 200°C. Place 2 sheets of puff pastry on a sheet of baking paper on a large cutting board. Brush 1 cm of the edge of one sheet with a little beaten egg, and overlap another sheet over it. Press the edge to join the sheets together into a large rectangle. Turn the rectangle so it is vertical on the bench. 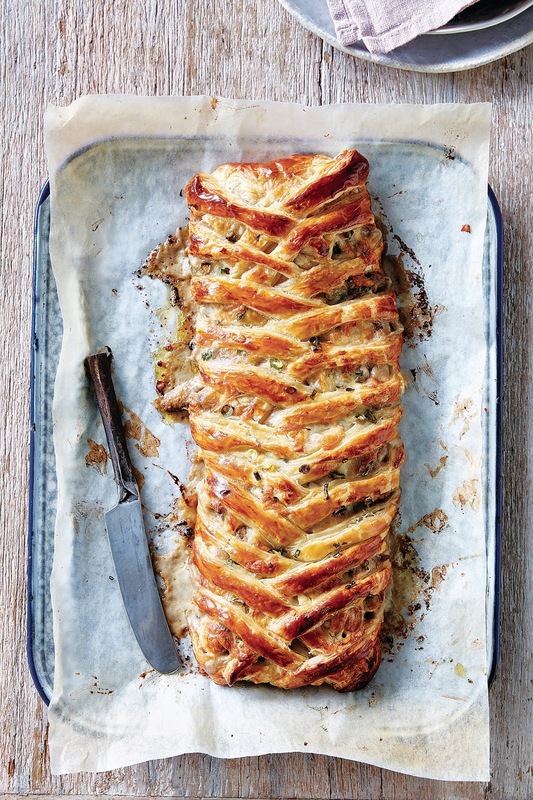 Using the back of a butter knife or a skewer, make faint lines on the pastry to divide it into equal thirds lengthways. Cut off the top two corners of the large rectangle to form a point. At the base of the large rectangle, cut a square out of the left and right thirds of the pastry. It should now resemble the shape of a big straight Christmas tree. 5. On the left and right thirds of the large rectangle (not the middle third), make incisions about 1.5 cm apart, following the angle of the upper point of the pastry and going to each edge. These will form your pastry braids for the strudel. Once the pastry is cut, lift it, still on the baking paper, onto a large baking tray. 6. Place the cooled chicken mixture along the middle third of the pastry, stopping short of the pointy and square-cut end. Sprinkle with the sliced shallots and the remaining cheese. Fold the pointy end over the chicken mixture, then fold the square end of the pastry over. Then, alternating from left to right, fold the strips of pastry over the chicken mixture. It will look a bit like a braid. Brush liberally with egg and bake for 20–25 minutes or until a deep golden brown. This is lovely served hot or at room temperature. Doesn't this sound delicious? Looking at the photo, I can almost smell the chicken and pastry. YUM. 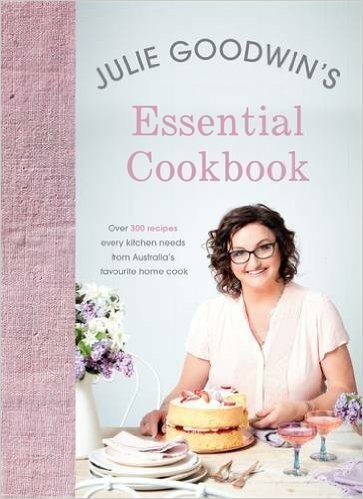 Julie Goodwin’s Essential Cookbook ($39.99) published by Hachette Australia. Having worn a military uniform myself, I'm very interested in the way in which they distinguish the different services, establish authority, unify employees across a variety of industries as well as identify schools and sports teams alike. Badge, Boot, Button - The Story of Australian Uniforms provides a detailed and well-researched overview of how Australian uniforms have changed and evolved over time. Written by Australian historian Craig Wilcox and covering uniforms from 1788 to the present, there's something to capture the interest of any reader. I enjoyed reading about the red shoulder capes (called a tippet) worn by nurses and was fascinated to learn that nurses could spend an hour a day ironing and starching their uniforms. Only those working the night shift were given a reprieve, because the starched uniforms were too noisy and could wake the patients. The history of the iconic slouch hat is included, as is the baggie green hat beloved by cricket fans and players. The evolution of the AFL uniform is covered and despite not being interested in football, I found it interesting nonetheless. I enjoyed the section on the Sydney Olympic volunteer uniform and the ever increasing competition in some corporate sectors. Relevant snippets from newspaper articles were incorporated into the text and gave a real insight into how these uniforms were received by the public - or at least the media - at the time. There's a distinct focus on military uniforms, although that's not terribly surprising given Wilcox worked at the Australian War Memorial. Over the centuries, uniforms have played an important part in Australian history, from the landing on Gallipoli to the High Court decision on the Mabo case. They've made soldiers and firefighters braver; humiliated convicts; empowered sporting heroes; both liberated and shackled women and made corporates fashionable. If you have any questions for Craig Wilcox about any kind of Australian uniform, let me know in the comments below and stay tuned for my upcoming interview with him. Update: click here for my interview with Craig Wilcox. I've always had an interest in archaeology. I don't mean fossils and dinosaurs, but the remnants of recent civilisations and those long buried and forgotten. When a new plague pit is discovered on a construction site or the long lost remains of Richard III were located in a supermarket carpark, I'm going to be there to read about it. 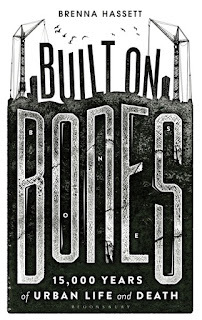 As the title suggests, Built on Bones by Brenna Hassett takes a look at 15,000 Years of Urban Life and Death. As an archaeologist she specialises in the human skeleton to look at whether the move towards an urban lifestyle results in an earlier death than the foragers and nomads of history. Hassett looks at the changes in skeletons - and teeth in particular - which provide plenty of interesting tidbits and conclusions. 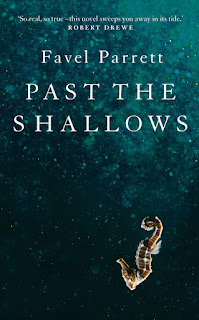 A highlight for me was on Page 49, where Hassett explains that with the move to agriculture and 'slurpable foods,' there was less work for our jaws, therefore less muscle, and as a consequence our jaws and faces have shrunk in size. This explains a great deal of the dental crowding and associated problems we see today. I enjoyed learning more about the history and symptoms of urban diseases including syphilis, smallpox, leprosy and TB and Hassett also piqued my interest on Page 153 when she wrote about the practice of burying criminals in embarrassing positions. 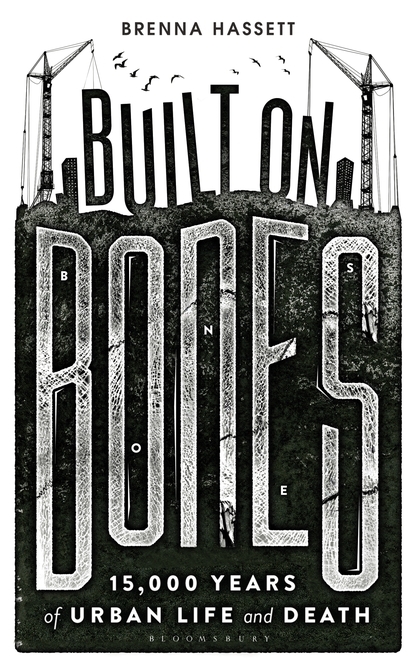 Ultimately though, Built on Bones was a whole lot more academic than I was expecting. For a complete novice it was tough going at times and quite scientific. What made this somewhat harder were the infuriating footnotes on every other page. The majority of the footnotes were jokes and comic asides which kept drawing me away from the text and disrupting my rhythm. Well, why didn't you just ignore them I can hear you ask. Well, I couldn't ignore them because occasionally there would be an absolute gem* I didn't want to miss, so I had to persevere. Built on Bones by Brenna Hassett is recommended for armchair archaeologists, scientists, doctors, medical professionals, historians and devotees of Darwinism. * Brenna shared the case of the Rising Star Cave, where a call-out was made for skinny and small archaeologists able to squeeze through a gap in a cave just 18 centimetres wide to excavate a collection of hominid fossils. Wow. I'm currently reading Julie Goodwin's Essential Cookbook by well-known Master Chef winner Julie Goodwin and Hachette Australia has kindly given me permission to share two of my favourite recipes from her book. Today, I can share a delicious looking pudding you can make with hot cross buns. 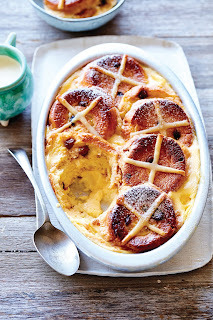 I can't wait to try this as soon as hot cross buns hit the shelves again in January. 1. In a large mixing bowl, combine the cream, milk, eggs, sugar and vanilla extract. 2. Cut the hot cross buns in thirds crossways. 3. In a 20 x 25 cm baking dish, arrange slices of bun to cover the base. Pour over the egg mixture to just cover the slices. Add another layer of bun slices and cover with egg mixture again. Place the last of the bun slices on top. Pour the remaining egg mixture evenly into the dish. Stand for 20 minutes before baking to allow the custard to soak into the bun. 4. Preheat the oven to 180°C. Bake the pudding for 40 minutes. Remove from the oven and serve warm, with cream. This sounds positively delicious, yum! The Hidden Thread is an historical romance novel set against the backdrop of the silk trade in 1760s London and the silk riots of the period. Anna moves to London following the death of her mother to find a suitable match and Henri is a young silk weaver apprentice. The romance that soon - but slowly - develops between them crosses the boundaries of class but readers can expect a 'clean read.' In fact I often felt as though I was reading a YA or MG novel. The most interesting aspects of the novel for me were definitely the silk designs and imagining the damask patterns described in seamstress Miss Charlotte's dress shop. I also desperately wanted to see Henri's masterpiece of silk weaving, having had the pattern designed, woven and completed throughout the course of the novel. I dearly wish the design had been used to form the cover; now that would have been perfect. The Hidden Thread also ignited my interest in seeing the silk weaving looms described in the novel at work, and references at the end for those wanting to learn more would have been a very welcome addition. 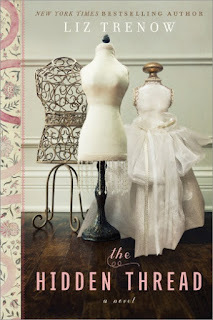 The Hidden Thread is recommended for YA readers and those looking for a light-hearted historical romance novel with a happy ending. 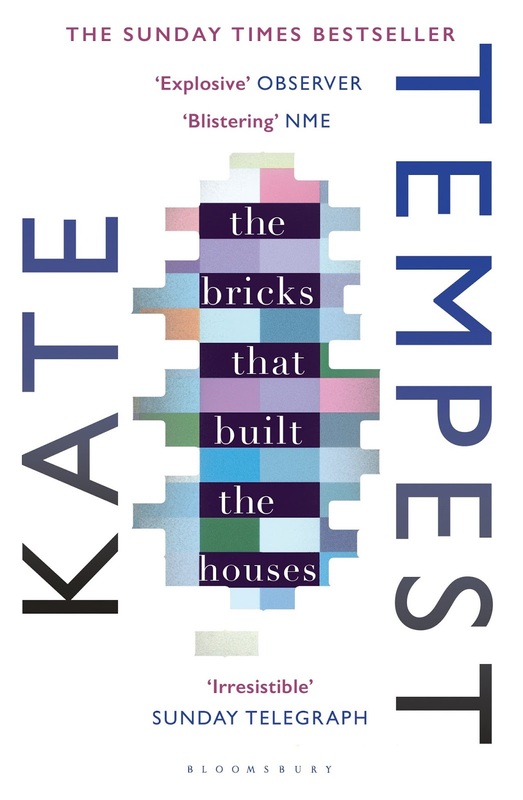 I'm a little late to the party but I just finished reading The Bricks That Built the Houses by Kate Tempest and boy, does she have a way with words. The prologue (entitled Leaving) was a face-slapping first encounter with a contemporary poet and I immediately understood the hype surrounding this young English poet and rapper. 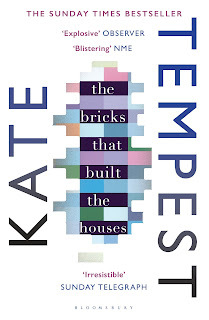 In The Bricks that Built the Houses, Tempest has chosen/created two characters from contemporary London and given us their gritty backstory, including their innermost thoughts, hopes and aspirations. Rich in language and character, the novel is also bleak in its depiction of life in the lower classes of London. 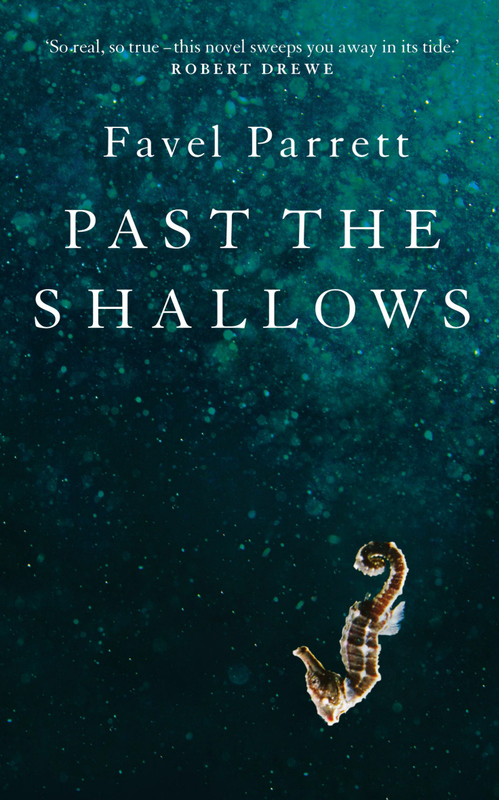 The novel contains themes of drugs, youth, loneliness and hope and often forces the reader into deep reflection alongside the characters on all manner of topics. Having heaped so much praise on her language and prose, I do need to confess that the ending was a real disappointment for me. I'm not sure how I wanted it to end, but after investing so much in the characters and being so impressed by the writing, I just wanted 'more'. I believe Kate Tempest is a writer of her generation and I'm certain she will continue to generate jaw dropping and influential material across all of her creative outlets (novels, plays, poetry and the spoken word) in the future. Definitely one to watch.